Breeding your horse - A roll of the dice. So, you are emotionally attached to your horse, and you think she is the greatest horse in the world. Other than having a stifle problem and occasional flare-ups of temper when she threatens to take a chunk out of your arm or face, she's the best horse ever! Now, you begin to think about breeding your mare and having a tiny foal to watch grow, play with, and train. Wouldn't that be a great experience? Before you go any further. Stop Think about what you are considering along with all the ramifications, not only of your situation, but the situations of horses everywhere. The high cost of euthanasia causes many horses to be kept alive long after they begin suffering from any number of distressing terminal illnesses, and many older horses are abandoned when they no longer serve their owners' needs. Breeding any animal is a huge responsibility that needs to be carefully thought through and planned. Since horses are large animals that live for many years and have specific needs, careful consideration must be given to the responsibilities involved in breeding your mare or stallion. No guarantee exists that a foal will look or act like the mare and stallion that produce it. The reality of breeding is that the best-laid plans can go awry and foals may fail to live up to the owners' expectations. Whether it is a conformation or temperament problem, or a lack of the desired color or physical appearance of the foal, it may become one of numerous unwanted horses for which homes are difficult to find. Ill health, loss of income, a change in jobs or location, and many other factors can affect the horse owners' ability to keep and care for their horses. Before breeding another horse, consider all the "what if's" that could happen in your life and determine what will happen to the horse, if you should become disabled or can no longer afford a horse. Don't let "barn blindness" in its many manifestations influence your decisions when it comes to breeding your horse. Genetics and Pedigree: Both the mare and the stallion should be excellent examples of their breed and each should bring qualities that will produce a foal that is an improvement on both parents. Many breeders think they can breed "pet quality" animals, but this often adds to the number of unwanted horses. Cost: Fees and costs associated with breeding add up very quickly. 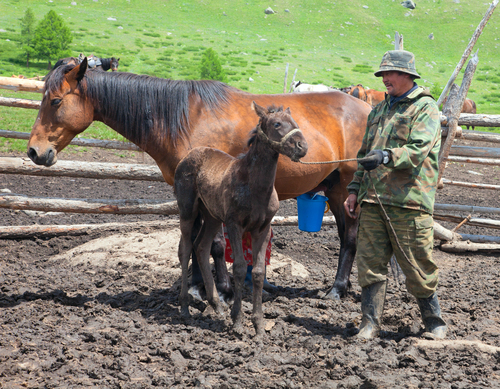 Caring for a pregnant mare with the necessary veterinarian involvement, supplements, and increased feeding costs can add up to several thousand additional dollars. Stud fees for a good stallion can be considerable, ranging from $500 to $1,500 and higher. For competition horses, fees are much higher and can range into the $100,000's and beyond. Conformation and Temperament: Only horses with excellent conformation and positive temperaments should be considered for breeding since these are often hereditary. If a horse has serious conformation faults or a negative temperament, it is not worth the risk of passing these flaws on to an offspring. 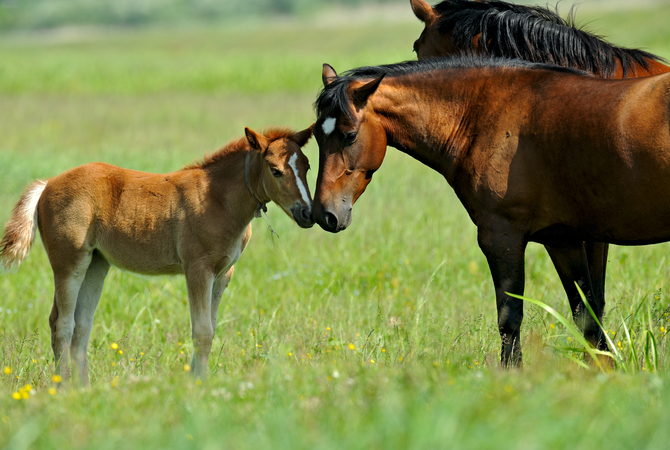 Time and Resources: Raising a foal takes time and physical and monetary resources. Veterinarian costs during the first year of life can add up very quickly, and the time necessary to keep a foal healthy and well-cared for can take a chunk out of your day 24/7/365. Safe Fencing and Physical Accommodations: A foal will test boundaries and accommodations. As with a human baby, adequate and safe surroundings need to be in place for a new foal. An older horse will avoid barbed wire and other obstacles, but a foal may scar or cripple itself by becoming entangled in fences, running into objects or getting out of its enclosure. Nature works a miracle in combining the genetics of the stallion and mare. What results is a truly unique indidual horse. No guarantee exists that a foal will look or act like the mare and stallion that produce it. Professional breeders spend a great deal of time and money determining what it will take to produce an exemplary animal, but even they are sometimes surprised by the outcome when the foal does not meet their expectations. In addition, a mare may die during a difficult pregnancy or as a result of giving birth to the foal, or the mare's health may be seriously compromised. When the mare dies, not only do you lose the companionship of your horse, but your investment in time and money becomes irretrievable. While catastrophic events during pregnancy are not common, the mare should be watched carefully during pregnancy for any signs of distress. illness or injury. Any signs of excessive accumulation of fluid in the underside of the belly, colic, or injuries from falling or rolling violently should be brought to the attention of a veterinarian. When it comes time for the mare to foal, don't expect a textbook delivery by the mare out in the pasture by herself. 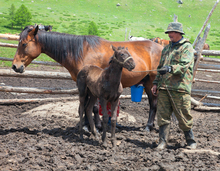 Be prepared to watch the mare carefully night and day during the last three weeks of the pregnancy. The new foal will demand a great deal of your time, especially if any problems develop with feeding, becoming ambulatory, or developing illnesses such as foal pneumonia. When careful attention is not paid to the genetics and pedigrees of the horses being bred, foals may be born with health problems ranging from minor to life-threatening. Beyond the importance of the characteristics of the mare and stallion, the responsible breed goes back generations to understand the potential for greatness and disease. For example, horses that have attractive color patterns may produce a foal with frame overo, in which case, the foal is completely white and suffers from intestinal abnormalities that prevent the passage of food through its digestive system. 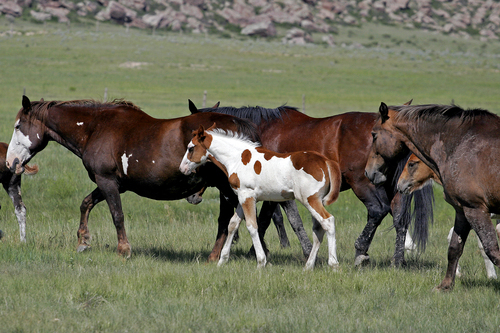 Affected foals usually die within days of birth. If your horse has a color pattern, it is recommended that any horses with any overo in their pedigrees be tested genetically before breeding for Overo Lethal White Foal Syndrome (OLWFS) to avoid producing a foal with this condition. Horses that have a coat in which silver-diluted colors are prevalent may be affected by an eye defect known as Anterior Segment Dysgenesis (ASD). ASD is a genetic malformation of the eye that causes development of cysts, misshapen pupils and defects of the iris, cornea, and lens of the horse's eye. Horses that carry the 'appaloosa' gene may be prone to night blindness and gray horses have a high risk of developing skin melanomas. When breeding your mare it is important to know everything possible about the stallion. Contagious Equine Metritis (CEM) also known as Taylorella equigenitalis and outbreaks of Equine Viral Arteritis (EVA) underscore the importance of doing diligent homework when choosing a stallion. If any questions exist as to the health and safety of the stallion, tests should be done to determine the state of the stallion's health to make sure that the health of the mare is not compromised as a result of breeding. Breed your horse only when you know everything possible about the state of the health and the genetic make-up and/or pedigree of the parents-to-be, and when you know for a fact that you can take on the long-term care of a new horse under circumstances that will create a productive and enjoyable situation for a number of years for both you and the horse.